Photo Courtesy of Art Howard/Ross et al. 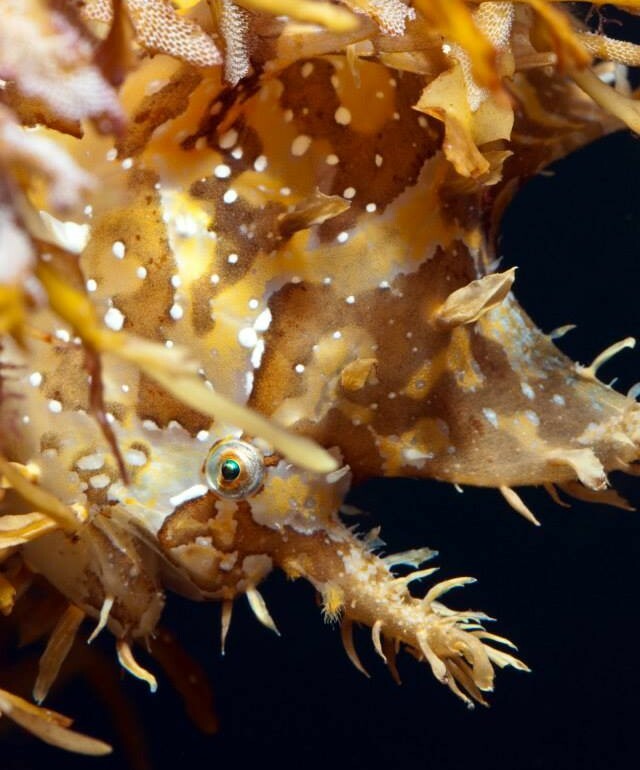 The Sargassum Fish is a type of anglerfish that lives on floating seaweed mats in sub-tropical and tropical seas. They are ambush predators that do best alone; this species is known for its cannibalistic nature. They may be housed with similar fish like scorpions if they are large enough. They should not be housed with other predators that are the same size or smaller than they are. Some anglers have been reported to consume streamlined fish like wrasses twice their length. They need to be provided with live foods like live shrimp and live saltwater fish several times weekly, but some anglers learn to eat frozen foods from a stick. Provide a minimum of a 30 gallon aquarium, but remember this fish is a messy eater and produces a lot of waste, so frequent water changes are needed. They won’t consume corals, but will eat any shrimp, crabs, or invertebrates that will fit in their mouth.